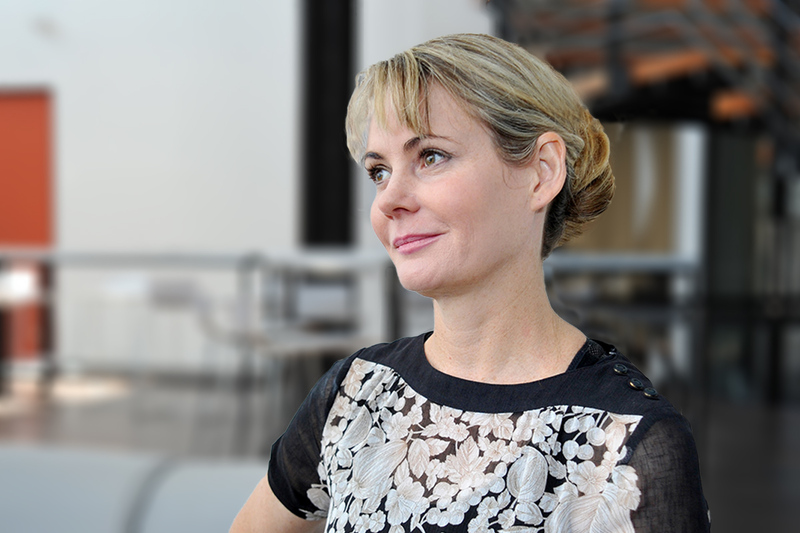 Manufacturing companies make significant contribution to NZ’s BERD according to a report released recently on the state of manufacturing in New Zealand. “Manufacturing Report 2018. Beyond commodities: Manufacturing into the future” identified that in 2016, national BERD was just $1.6 million, with manufacturing accounting for 42% of that ($671 million). The report also identified that the metals manufacturing sector employs more people than the wood and paper sector – with 21,950 people employed in wood and paper manufacturing versus 29,000 in metals for 2017. This means metals employment was more than 30% greater than wood and paper. However, while it’s clear that our industry makes a significant contribution to New Zealand’s economy and that our engagement in R&D is higher than the national average – its important to note we still fall behind global benchmarks and our own national best practice. Manufacturing Report 2018. 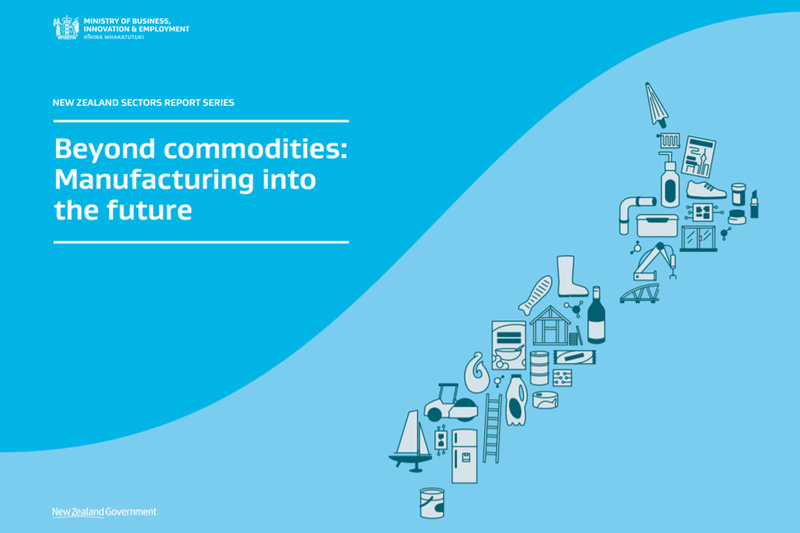 Beyond commodities: Manufacturing into the future. The report also identified that the manufacturing sector as a whole contributes 12% of New Zealand’s economy ($23 billion). Put in context, this means metals manufacturing plays a key role in the success of our nations economy. R&D activity was also reported to be more common in manufacturing firms than most others part of the economy. The NZ average percentage of firms reporting R&D activity was 9%, with 12% of metals manufacturing reporting R&D activity. However, this is below the average of manufacturing overall, with 19% of firms reporting R&D activity and the chemicals and refining classification reporting the highest activity, at 45%. Our sectors reported activity in innovation was just on the national average, with 49% of firms reporting innovation activity in 2015. The highest reported average was in the media and telecommunications sector, reported at 64% and the manufacturing average overall was 53%. What is a really exciting trend is the growth in R&D expenditure per firm for the metals classification, growing from $147,000 in 2008, to $971,000 in 2016. The machinery and equipment classification reported the highest average manufacturing spend, at $1.17 million per firm. We’re very pleased that MBIE has released this report. It’s very timely given Government’s recent focus on supporting the timber industry and our counter-perspective, that the metals sector is also a major value-adder of raw materials. The reported figures certainly demonstrate this. In saying this, we also recognise that there is room for improvement. Our engagement in R&D, while higher than the national average, still falls behind global benchmarks and NZ best practice. Our commitment in innovation is lower than all other manufacturing sectors except wood and paper (48%) – and is something we certainly would like to see increase. That’s why we’re taking action to assist our members to more actively engage in this space. We’ve commissioned BERL to undertake an economic study of metal’s performance against Treasury’s Living Standards Framework. It’s our belief that our metals-based industry is making a very strong contribution to the Living Standards of New Zealand – which is supported by the Manufacturing Report 2018, but we’d like to validate this with more indepth data. Excitingly, some of our members have agreed to be interviewed by BERL’s economists and we’ll be sending a survey to assist in this assessment to you all in the near future. Our industry makes a significant contribution to the New Zealand economy. However, while there are certainly some great case studies for innovation for our sector (like NZ Steel who were profiled in the Beyond Commodities report), the fact remains we’re still falling behind in terms of our sector’s participation in innovation activity. Help us turn this around by sharing your perspective on the matter when our survey is sent out. If we’re to improve the R&D and/or innovation capability of your company we have to understand clearly what is holding you back. We’ve also taken steps to develop an exciting Innovation program which arms your leadership team with a key team player to mobilise and innovate your commercialisation strategy. Stop wasting time, get your products to market quickly and efficiently and maximise your success – it’s as simple as investing in someone who has the potential to implement this approach into your organisation. 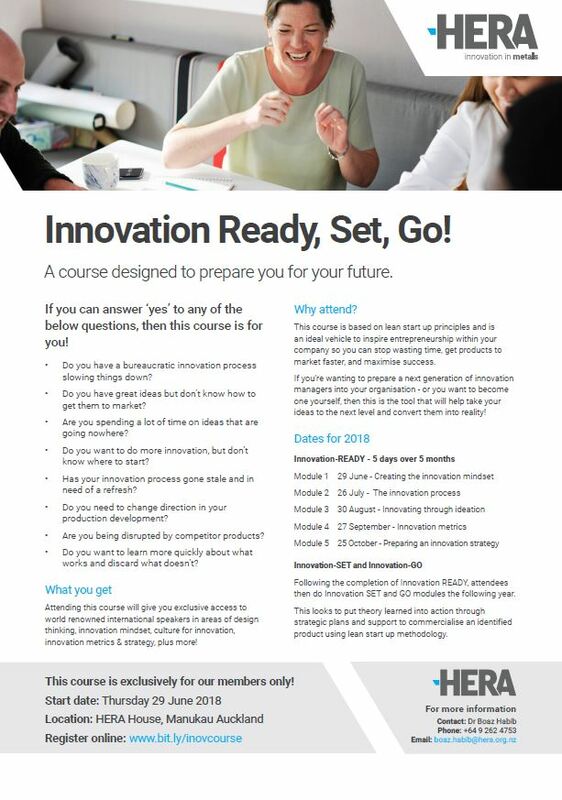 Our new Innovation Ready-Set-Go program is exclusive to our members and is specifically designed for our industry – boasting exciting international guest speakers and practical tools for implementation. We’re absolutely committed to upskilling our industry to close the R&D and innovation gap that has been highlighted. That’s why as your catalyst for innovation we’ve stepped up to heavily subsidise this course for our members. On top of this we’ve worked with NZTE to get this course fee further subsidised by 50% for those members with less than 50 full time employees on their books at time of application. We’re also open to flexible payment schemes to work with you to forge a greater future in the long term. For more information, please contact our General Manager Industry Development Boaz Habib. Alternatively, book your place today – the first of five modules over five months kicks off on Friday 29 June, make sure theres a seat with your name on it!